Ancient Indian civilization gave the world the zero on which rests modern-day calculations. And also the ancient system of Vedic mathematics, which is on a revival path after several thousand years and is being used by students the world over to crack complicated equations. The system, as explained in Atharva Veda, the last of the four ancient Vedic scriptures, is broadly based on 16 sutras (formulas) and 13 sub-sutras (smaller theorems or formulas) and is cheaper, faster and paperless. It is less taxing and facilitates balanced growth of the mind and intellect among children without burdening them with complex numbers. Schools in the subcontinent, neighboring South Asian nations, Europe and America are falling back on ancient Indian texts to simplify intricate calculations that make up present-day mathematics. The world of Vedic Maths, says Vedic mathematician Pradeep Kumar, who has authored more than 75 books on the subject, is mental. It does not require finger-counting, carrying numbers, manual calculations and electronic computations. "The premise is simple. Break down complex numbers into their components of 10s or 100s and calculate mentally. For example, when 38 is added to 46 in conventional math, we carry over one and add it to the top-most digit in the column representing 10 (in the Indian decimal system). The result is 84. "But in Vedic math, we break down the number into its decimal components. First, we add 30 and 40, the sum of which is 70. And then add 8 and 6, which is 14. The zero stays and one adds strength to the cardinal number in the bigger decimal column. Hence, 7 becomes 8. The end result is 84," Kumar explained, citing an example. Kumar, a mechanical engineer and an alumnus from the prestigious Indian Institute of Management (IIM)-Bangalore, heads the Magical Methods institute in the Indian capital New Delhi. He works with several schools in the Gulf, North America, Europe and Southeast Asian countries to promote Vedic math. "On an average, I conduct 30 workshops in schools across Asia, Europe and Canada every year. At this moment, I have three projects with schools in Hong Kong, Singapore and Bangkok respectively," Kumar said. He has 57 centers and more than 100 trained Vedic math teachers on his rolls. Vedic math, he asserts confidently, is more popular abroad than in India. The National Council of Education Research and Training, the nodal body monitoring the quality of school books in India, has officially acknowledged Vedic math. But the subject has not yet been incorporated in the scholastic curriculum. "I am pushing for it," said Kumar. The mathematician is trying to negotiate a deal with the Indian government to teach Vedic math in schools across the country. Mathematics, for millions of school children across India, is still the weak link. The subject either feels too dry or seems to be loaded with numbers. It leaves room for errors and breeds over-dependence on gizmos like calculators and computers because of the way it is taught. "Mathematics has to be made interesting to children," said Kumar, who has designed several puzzles and intelligent mind games for the first-timers in his Vedic classrooms to increase their power of concentration and the ability to think fast. Vedic math was interpreted in the modern context in the 1960s in a book "Vedic Mathematics" by Seer Bharati Krisna Thirthaji Maharaja, a learned Brahmin teacher from Tamil Nadu in southern India. The scholar uses 16 sutras and 13 sub-sutras to tackle the entire gamut of mathematical problems mentally in less than one-tenth of the time taken to solve them through conventional methods. According to mathematicians from the Maharishi School in Lancashire, the sutras, or the aphorisms, if translated in English boils down to simple codes like "by one more than the one before" and "all from nine and the last from 10". The codes describe the natural processes of the mind. "For instance, if we want to subtract 564 from 1,000, we can apply the sutra 'all from nine and the last from 10'. It means, each numeral in 564 is subtracted from nine and the last figure from 10. The result is 436. And the calculations are mental," a spokesperson for the school said. Veterans like Kumar take less than five seconds to add two sets of 24-digit numbers, down to its last decimal point. "It comes with practice," he said simply. The simplest and the most magical of the sutra, said Kumar, is the "yadadunam sutra" used for squaring and cubing numbers. "Yahudunam tavdunam, vargam cha yojyet", he chants. Roughly translated, it means: whatever is farthest, push it farther to the other side and root it. Then bring back what you have pushed aside and place them side by side to get the resultant number. In application, the square of 108 (108 to the power 2), according to the sutra, could be simplified into 108+8/8 to the power 2, which is 108+8=116 and 8X8=64. The answer lies in bringing the two numbers back together: 11664. 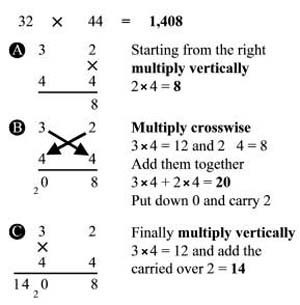 "By one more than one before", "All from nine and the last from 10", "Vertically and crosswise", "Transpose and apply", "by addition and by subtraction" and "by completion and non-completion". The sub-sutras, which take off from the sutras and occur in combination of the sutras, are more complex. The Vedic math expert, who used the technique to solve his mathematical problems in management, has designed modules for Indian students trying to crack the prestigious Indian Institutes of Technology (IIT) and Indian Institutes of Management (IIM) entrance examinations as well as tests for bank jobs and the prestigious Indian Administrative Service examination. So, for cutting edge competency in Maths, just delve into India's ancient past. That's what the world is doing.